Keep your modular Panacea fence sections upright and sturdy using these Panacea Black Garden Fence Posts. This package of 12, rounded metal posts provides support for several pieces of your existing Panacea modular fence sections (not included), helping you create a beautiful garden edge or lawn barrier. The round body of each post installs through the loops on your fence pieces, while the pointed end inserts into soil in moments. The black color of each adds a timeless look, and a rounded finial with a slight point completes the stakes. Their metal construction remains durable and usable for many seasons, and the 37.5" height of each is perfect for select Panacea fence sections. Support your existing fence sections easily using these Black Garden Fence Posts. 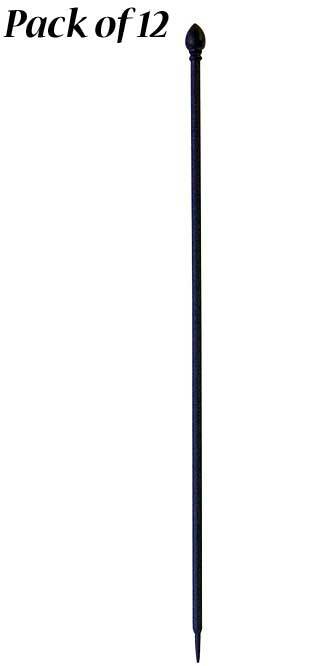 Note: This case pack contains 12 of the Panacea Garden Fence Posts, Black, 38"H each.